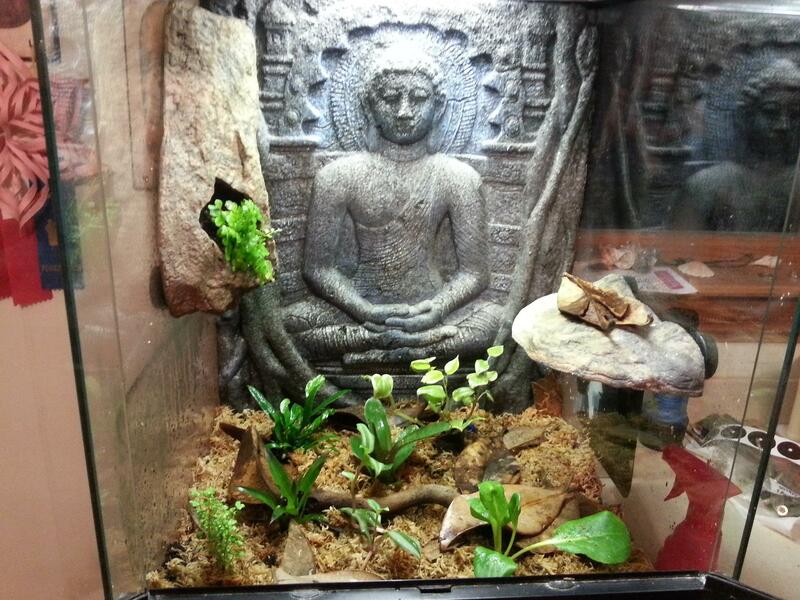 While clearly not where you would find this dyeing poison dart frog in its natural habitat, my terrarium's setup (pictured above) is a good representation. You can see by the droplets of water on the inside of the glass that I keep it quite humid in there; you can actually see the pink squirt bottle I use to mist the tank two to three times a day next to the enclosure. The plants vary in species but contain ferns, bromeliads, and common vine plants. The substrate is sphagnum moss, which retains moisture and wicks water down to a dirt layer below, which hydrates the roots of my plants and also contains and anti-fungicide which keeps harmful fungi from growing in my tank. Below the dirt layer is a square of landscape fabric which separates the dirt from the rock layer I have at the bottom, which provides a layer for excess water to sit so that it doesn't cause any flooding or molding of my plants. As mentioned on the Classification page, these frogs are commonly found among the leaf litter in the tank, which I have also provided for my synthetic natural environment. Perdita, my female frog, is usually found underneath the leaves in the tank or in the rock structure hanging from the left of the enclosure. Pongo, my male frog, is a bit more adventurous and goes where he pleases. He is pictured here, sitting atop the leave litter on the raised perch which you can see on the right side of the tank. On to a more scientific approach to the natural habitat of this species, they are often referred to as coming from a central range from Suriname. 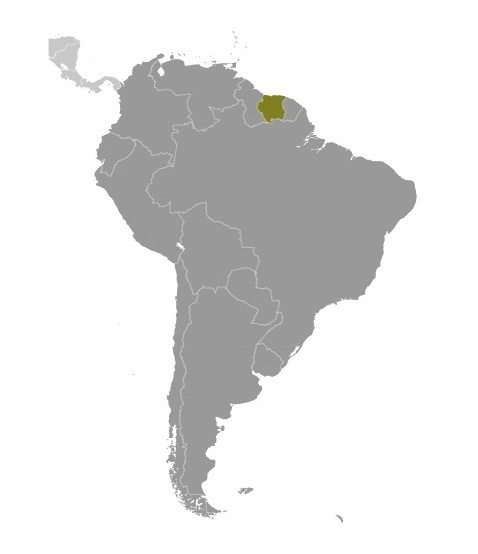 Most of their distribution is in Suriname on the "forest-islands" found within the Sipaliwini-savanna, few frogs having been found and collected in the forests along the western border of the savanna. These frogs require areas with high humidity and moderate to cooler temperatures. They spend most of their time on the ground among leaf litter, rarely going into pools of water. While being mostly terrestrial, these organisms, when venturing to water, only tolerate fresh water sources. Dendrobatid frogs are very territorial and maintain a specific area of range within which they discourage other frogs from entering. 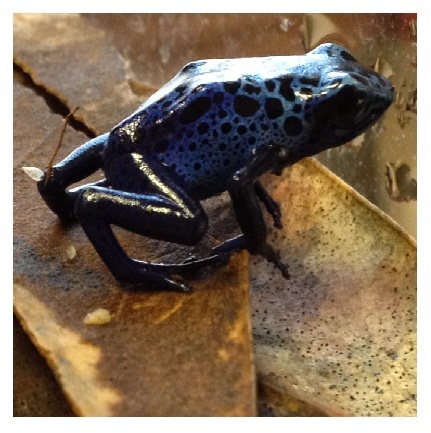 Hoodmoed, in 1969, conducted extensive studies of Dendrobates azureus and found many unique characteristics. Among some of the general range details, as mentioned before, he noted that the Dyeing dart frog was only found when there were also boulders. While not water-based amphibians, these frogs were usually captured within twenty meters of the creeks that ran through the various forest islands. This frog was also captured within a range of 315 and 430 meters of elevation above sea level. The Dyeing dart frog lives among various animals common to South America including the jaguar and lives among various trees such as Theobroma cacao and other such plants like the Stone-breaker. To learn what other organisms inhabit Suriname and the areas the Dyeing dart frog inhabit, visit the website for the National Zoological Collection of Suriname. More animals which interact and live among the Dyeing dart frog will be mentioned on the interactions page, later in this tour but feel free to skip ahead.